Rahu Kam Duang (Eclipse God to improve your karma and fate). 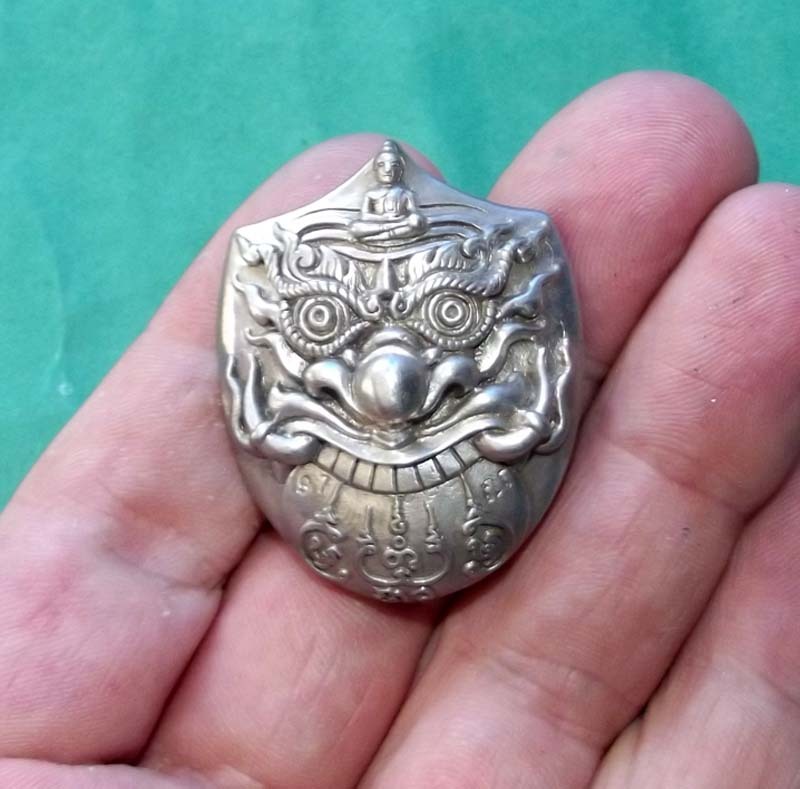 Made from Nuea Ngern Yuang Boran (Solid Silver). Empowered each night during a 3 Month ‘Traimas’ retreat by LP Naen in his Kuti, and finally given a massive major empowerment with Puttapisek ceremony. 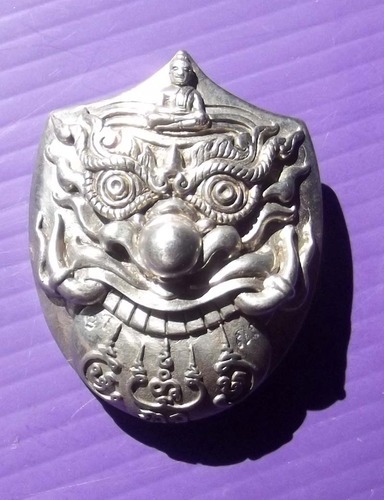 The front face features Pra Rahu eating the Moon, with a Buddha Image on its forehead, and Sacred Khom Incantaitons embossed on the bottom. This is the Ongk kroo Mnasterpiece Version which was top of the Range. The Rear face is filled with Muan Sarn Maha Lap Maha Choke (Sacred Powders with powers to increase Luck, Good Fate and Prosperous Fortunes). 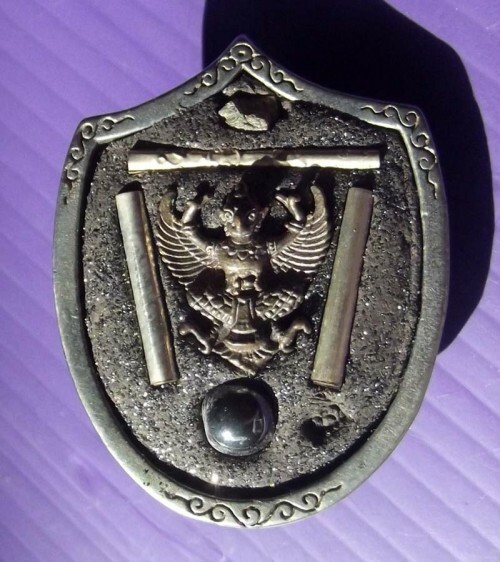 Three Takrut Serm Duang for improved Karma and Fate are inserted, along a piece of Lek Lai, piece of sacred relic, and a Garuda bird for the Power to overcome and rise above obstacles, enemies and dangers. Size; 4 Cm High x 3.5 Cm Wide. 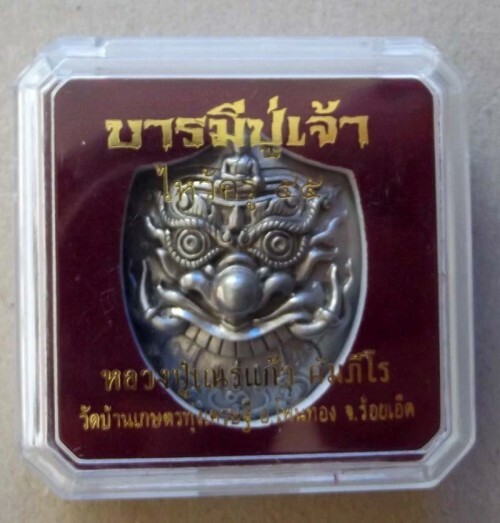 This edition saw a large range of different amulets in different materials issued, including Rahu, Phu Jao Saming Prai images (Tiger face Ruesi), and some Sariga Pak Dee amulets. Apart from the Ongk Kroo, some special hand painted versions of the pra Rahu range were also released with a special Gammagarn Collector set which included a Hand Painted Phu Jao Saming Prai Statue.